Tamil movies : Dasavatharam – so far!! Well, the one film that everyone expects to be the trendsetter for the coming year is Kamal’s Dasavatharam. Indicating the ten incarnations of Lord Vishnu according to Hindu mythology, the film will show Kamal in as different looks as one can imagine. It is no doubt creative fodder for this aesthete of an actor. Kamal is always known for his perfectionism when it comes to doing the groundwork for his projects. Every minute detail is attended to and there are no loose strings which are sorted out on takes. For Dasavatharam, Kamal spent a whole month scouting for the right look. He worked closely with leading make up technicians and decided upon the persona which he would portray besides noting down the items required to do them up. In fact, director K.S. Ravikumar is so thrilled with the outcome that he just cannot wait for the shooting to start. For heroine’s role, Parineeta girl, Vidya Balan opted out at the last moment after saying yes initially. Shreya, the Sivaji girl is rumored to have accepted. If this is true, then she has the unique distinction of working with two legends back to back. Napoleon and Jayaram have important roles. Crazy Mohan has penned the dialogues while story is by Kamal’s favorite, Sujatha. Himesh Reshamiyya, the popular music director from Bollywood makes his debut in Tamil. You can expect some swinging, Arabian-influenced music. Editing is by A. Sreekar Prasad. Screenplay and direction are by KSR and Oscar Ravichandran is the producer. The film is all set to hit floors soon. Meanwhile, Kamal who never publicizes his good samaritan acts, donated about 50,000 pairs of footwear to poor and needy children. As it is the beginning of the academic year, he also donated books and notebooks. He is often involved in many charitable activities like blood donation camps, eye checkups and relief efforts during calamities. • Rajni or Kamal – Who will push Shreya to top? • Meera Jasmine in Dasavatharam? • Top 10 Super directors of Tamil cinema!! 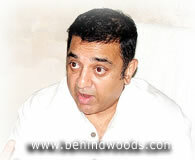 • Catch the latest on Kamal's Dasavatharam makeup!! • NDTV explores ‘The Rajni Factor’ • Parijatham – a big comeback for Bhagyaraj? • Bloodletting or Laughter – Take your pick! • Selva-Dhanush-Yuvan combo rocks!